Although I devour John Grisham's legal novels I equally enjoy his storytelling outside that scope. I loved A painted house but Calico Joe is equally fascinating and reveals his love of baseball, also part of the previously mentioned novel. If you're more into football I recommend Playing for Pizza. With every story of Grisham I feel I'm in it, or being part of it, that's how vivid and realistic he paints a picture. Can't wait to read his next one or for someone to make a film of A painted House. Review Written by Bernie Weisz, Historian Pembroke Pines, Florida, U.S.A. September 30, 2012 Contact: BernWei1@aol.com Title of Review: The Code of Baseball, A Ruined Childhood & A Trip Down Memory Lane! 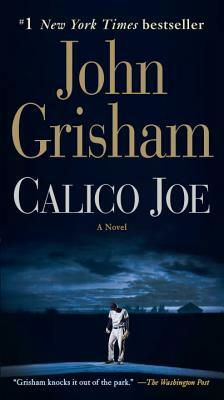 Anyone that became a teenager in the early 1970's will immediately take to John Grisham's "Calico Joe." Especially one that grew up in New York and liked baseball. I know, I was one of them. Grisham's book revolves around a washed up, aging picture for the New York Mets named Paul Tracy and his mercurial, volatile relationship with his son Paul. Added in is a rookie phenom for the Cubs named Joe Castle. Castle, dubbed "Calico Joe," sets major league records in his 1973 rookie debut for consecutive games safely hit. Paul Castle fell in love with Calico Joe, even keeping a scrapbook of his accolades unbeknownst to his father. Grisham portrays Warren as a philanderer, a beanball artist, a drunkard and an abusive husband and father. Shades of the Tony Conigliaro incident are introduced when the Cubs come into town to play the Mets with the National League East pennant on the line. With Paul and his disgruntled mother in the stands at Shea Stadium, the two watch as Castle goes up against his father after successfully pounding Warren for a hit his first time up. The "code of baseball" is introduced, at least Warren's conception of it. If a batsman shows up the pitcher in any way the previous at bat, or is a cocky rookie, the next at bat will surely be a beanball. However, Warren was a cruel, mean "headhunter," and demanded Paul be like him in playing Little League. Without any remorse, the senior Tracy will throw at anyone's head as revenge, rarely missing. In Castle's second at bat, the lives of both the Castle and Tracy are forever changed. The ironies involved and the unpredictable twists of fate make this novel truly amazing. The names thrown out, e.g. Tom Seaver, Bobby Murcer, Ron Santo, Ferguson Jenkins, etc., bring back such vivid memories of a reader's lost youthhood that it is impossible to not love and embrace this fantastically written novel. Even more realistic are the memories Grisham introduces, such as his descriptions of the Long Island Railroad being ridden, Willets Point in Flushing and both old Shea and Yankee Stadium, Wrigley Field, etc., with fitting descriptions of the temperaments of the fans of each. Grisham fast forwards forty years later and cleverly plays out a scenario involving Warren, dying of cancer, a caustic Paul and a forever enfeebled Joe Castle. The realism is strikingly apparent, regardless of Grisham's introduction of a fictional protagonist. In fact, the author cleverly let former Cub infielder Don Kessinger proof read and correct "Calico Joe" for realism. Kessinger's interjections make this story so absorbing, captivating and realistic that anyone reading this cannot but be spellbound by "Calico Joe." Memories flash of Carl Mays, Ray Chapman and Tony C. Mays was a right-handed pitcher in Major League Baseball from 1915 to 1929. Despite impressive career statistics, he is primarily remembered for throwing a beanball on August 16, 1920, that struck and killed Ray Chapman of the Cleveland Indians, making Chapman the only Major League player to die as a direct result of an injury sustained on the field. Similarly, Tony Conigliaro nicknamed "Tony C" played for the Boston Red Sox during their "Impossible Dream" season of 1967. He was hit in the face by a pitch from Jack Fisher, causing a severe eye injury and derailing his career. Though he would make a dramatic comeback from the injury, his career was not the same afterwards. Whether you like baseball or not, "Calico Joe" has something for any reader, guaranteeing a satisfying read! I love this book and I'm not a sports nut. I bought it because of the author, but I love it because of the plot and message.